8VSB/QAM and ASI analysis probe for USB-2 with RFXpert. 8VSB/QAM and ASI analysis probe for USB-2 with StreamXpert 2.1 stream analyzer software. 8VSB/QAM and ASI analysis probe for USB-2 with RFXpert and StreamXpert. 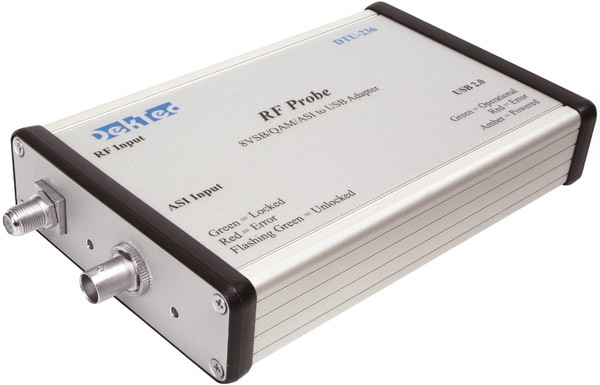 Light-weight, easy-to-use RF adapter for tuning to any UHF/VHF or cable channel in the 45 to 1002-MHz range. Channel plans for world-wide regions. Capture TS signals directly to file on a laptop PC for easy field recording. DekTec's USB-2 hardware-based receiver for DVB-T2, T, C2, C and ISDB-T. With full support for single- and multi-PLP, as well as SISO and MISO, this USB-2 receiver is perfectly compliant to DVB-T2 v1.3.1.